The German solar industry has walked away the sole winner from Germany's most recent solar and onshore wind tender, receiving contracts for the entire 210 megawatts (MW) awarded in an auction which was heavily oversubscribed. Wind energy accounted for 35% of Great Britain's electricity generation for the week running Friday 8 March to Thursday 14 March, beating out all other generation sources, and also saw offshore wind beat out nuclear energy. Though global clean energy investment again exceeded $300 billion for the fifth year in a row in 2018, it was nevertheless down on 2017 figures to $332.1 billion, hovering around the same mark as 2016 which was also down on the year previous. The UK Government on Tuesday finally proposed what amounts to relatively mediocre guidelines intended to support the development of small-scale renewable energy technologies by ensuring remuneration for any and all electricity generated that is supplied to the grid by small-scale generators. A new analysis from UK-based website Carbon Brief has found that electricity generation in the United Kingdom last year fell to its lowest level since 1994, while at the same time, renewable energy electricity generation increased to another record high and accounted for an estimated 33% in 2018. Renewables were the largest source of electricity in Germany in 2018, outpacing coal for the first time. Renewable energy is expected to cover approximately 38% of German electricity consumption this year, an increase of 2% over 2017, according to the latest figures published on Thursday. 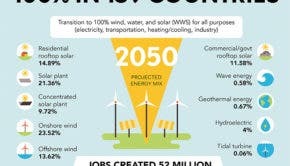 The United States Energy Information Administration has recently published data revealing that renewable energy sources provided nearly 18% of the country's electrical generation through the first nine months of the year, while solar and wind grew substantially as compared to the same nine months a year ago. Danish wind energy giant Ørsted has announced this week that it has not only increased its offshore wind target to 15 gigawatts (GW) by 2025 but has also committed DKK 200 billion ($30.2 billion) to invest in green energy by the same time. Julien Uhlig, founder of ENTRADE X, on the importance of decentralized energy and access for all. Pushed over the line by two coal-to-biomass conversions and continuing growth in offshore wind, the British renewable energy industry finally surpassed the capacity levels of its fossil fuel predecessors, with total capacity reaching 42 gigawatts (GW) in the third quarter, beating out the fossil fuel industry which only has 40.6 GW. Does The Future Of Agriculture Lie In Biomass?